Luton striker Elliot Lee has earned his second nomination for November after being named in the running for the PFA Bristol Street Motors Fans League One Player of the Month Award. 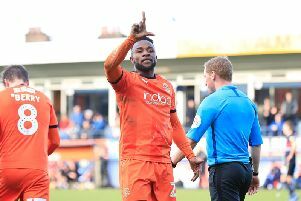 The former West Ham attacker, who is already up for the Sky Bet League One Player of the Month gong, scored five goals and grabbed one assist as Luton went unbeaten. He faces competition from Joe Aribo (Charlton Athletic), Tom Eaves (Gillingham), Gareth Evans (Portsmouth), Joe Jacobson (Wycombe) and Aiden McGeady (Sunderland).